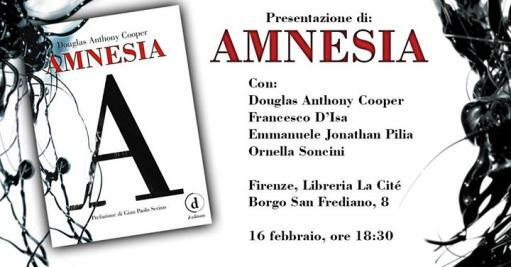 D Editore brings the US to Cité, with Douglas Anthony Cooper and his Amnesia: the author, great lover of Florence, will be present for a chat with Francesco D'Isa, Ornella Soncini and the publisher Emmanuele Jonathan Pilia. Experimental and dreamlike text, Amnesia tells the story of a man, Izzy Darlow, who forces an anonymous archivist to listen to his story, plunging the reader into a surreal and hypnotic Toronto. The story of Izzy Darlow and the events of the disintegration of his family intertwine with the story of Katie, a young woman possessed by delusions and hallucinations, and with the spaces in which the protagonists are immersed - which in Amnesia represent more than a stage where the action takes place. The protagonists of Amnesia move in a circular novel, between declining architectural spaces, libraries that preserve the memories of the history of humanity, wild gorges and ancient libraries. They read of a distant past, kept in ancient volumes, and try to remember their history by constantly forgetting it. They learn to love, forgetting that they do not know how to do it. To present the book, there will be the same author, Douglas Anthony Cooper, who will tell us about the folds of this intricate novel. «Cooper has many gifts: the ability to produce fantastic and cinematographic images, a talent for creating musical narratives and rich symbols, the strength to face cultured and ambitious themes».